Lancaster Target Manager Skyla Gray (center) presented a $500 check to Lancaster Station Captain Pat Nelson (right) and Lt. Dave Oliva (left) at Lancaster City Hall Thursday afternoon (March 21). LANCASTER – The Target Corporation is doing its part to keep Antelope Valley youth out of the criminal justice system. 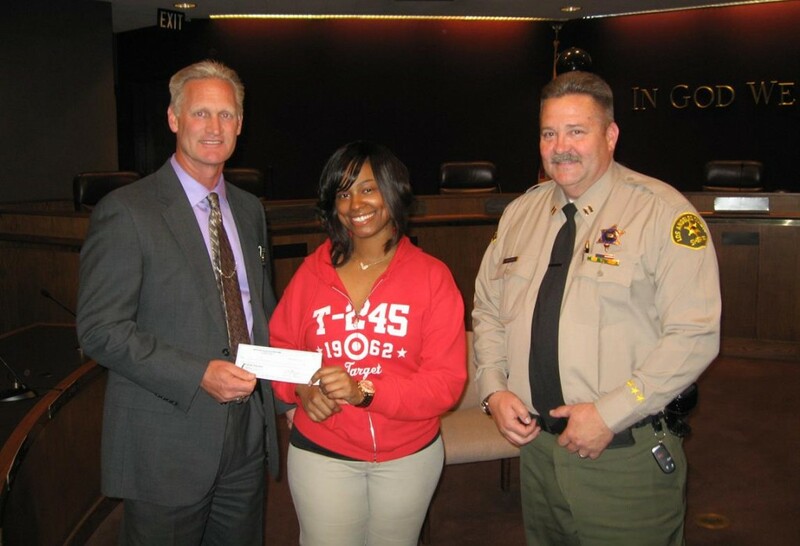 Lancaster Target Manager Skyla Gray on Thursday presented a $500 to the Antelope Valley Community Youth Court (AVCYC), and alternative to the juvenile court system that leaves no permanent record. AVCYC provides skills and intervention to youths who make mistakes and take responsibility for their actions, and assists the youths in making better decisions upon graduation from the program. The Los Angeles County Sheriff’s Department Lancaster Station works hand-in-hand with the City of Lancaster to maintain the AVCYC, and the city administers the program with the help of several volunteer leaders from the community. The Target Corporation’s donation will assist case workers with supplies and provide certificates for youth court graduates, officials said. The donation is part of the millions of dollars the Target Corporation gives out to law enforcement agencies throughout the country every year, in an effort to build strong, healthy and safe communities, according to company officials. Last year, Lancaster Station was awarded public safety grant funds from Target to use in a way which keeps in line with Target’s goal for the communities in which they do business. 1 comment for "Target donates to youth court"